Do we really know what the Blue Jackets‘ opening-night roster will look like? While many rosters spots are already taken, several prospects have set their sights on making the team this fall. In this edition of Blue Jackets’ Pressure Points, we focus on the dark horses who could surprise everyone and make the team. A couple of things before we begin. First given that it is the end of July as of this writing, the offseason has plenty of time left. There exists at least a good possibility that the Blue Jackets will look to improve their club via trade. Should one go down, that could open the door for somebody to claim a roster spot. Second and more importantly, we have to remember the way the Blue Jackets do business. If they think a player ready, they will make room for them. It’s as simple as that. If someone on this list has the training camp of their life and proves they’re ready, we’ll see them in October. Need a quick reminder of this? How many of you saw Markus Nutivaara as a slam dunk to make the team last season? The way I see it, of the 23 rosters spots up for grabs, 19 of them are set. That would leave four spots open for competition. Here is what I think things stand as of this moment, subject to change if a trade happens. With the four remaining spots, you could see three forwards and one defenseman or four forwards. After last season, you have to wonder if the team wants to carry eight defensemen again. Given the strength of the potential top-seven defensemen, I’d lean towards a 14-7-2 setup, with four spots open for forwards. I didn’t even mention Scott Harrington. He just signed a two-year deal to stay with the Blue Jackets. He’s the eighth defenseman as it stands. He needs waivers to go to Cleveland. Recall he came to the Blue Jackets in the Kerby Rychel deal. Part of that deal was a conditional draft pick. If Harrington goes on waivers and gets claimed, the Maple Leafs would give the Blue Jackets a fifth-round pick. If Harrington clears, there is no pick. This could be something to watch if the Blue Jackets choose to go with seven defensemen. Who Could Get Those Open Spots? Our focus here is on dark horses who could make the team. We think Pierre-Luc Dubois will get every opportunity to make the team. He doesn’t qualify as a dark horse. Neither does a player like Sonny Milano. Most everyone knows he could make this roster. My list of potential dark horses is bigger than you think, especially at depth forward. If there’s another storyline worth following when camp begins, it’s the open competition for those last few spots. Preseason performance will go a long way in determining who makes the cut. With that said, here are my dark horses that could make the team this fall. Motte came to the Blue Jackets along with Artemi Panarin in the trade that sent both Brandon Saad and Anton Forsberg to the Chicago Blackhawks. Although Motte struggled towards the end of last season with his play and injuries, the Blue Jackets are high on him for his future. Kekalainen was also impressed that Motte made the Blackhawks right away. That’s a feat in itself. We’re going to hear a lot about Motte this season. He could make the Blue Jackets right away and start on the fourth line. He has an advantage of being able to play both center and wing. If he doesn’t make the Blue Jackets, he’ll start in Cleveland and give a boost to the Monsters. He’ll also have his phone handy as he’ll get one of the first calls for when injury happens. In another draft-day trade, the Blue Jackets acquired Schroeder from the Minnesota Wild in exchange for prospect Dante Salituro. With the departure of William Karlsson came opportunity on the Blue Jackets’ bottom-six. Schroeder fits the mold here. The Blue Jackets are Schroeder’s third NHL team. He previously played with the Wild and Canucks. He has 17 NHL goals in his career to date as a bottom-six player. In his limited ice-time, Schroeder has produced. Take a look at Schroeder versus the recently departed Karlsson according to Own the Puck. Schroeder produced similar numbers to Karlsson with less ice time. If I had to choose a forward on the fringe that has the best chance to make the Blue Jackets in the fall, it’s Schroeder. A fourth line of Matt Calvert, Lukas Sedlak and Schroeder is a definite possibility. Hannikainen is well-known to Blue Jackets’ fans, but isn’t the household name in other places. With a new two-year deal in hand, Hannikainen wants to make the Blue Jackets this fall. He’ll have every opportunity to do so. Hannikainen showed flashes of the kind of player he is. In Cleveland, he was a go-to if the Monsters needed scoring. He played both special-teams units and provided energy with his speed. In Columbus, he brought speed and tenacity to the bottom-six while showing some upside as a penalty killer. Given his primary position is left-wing, I believe he starts in Cleveland this season and likely makes the Blue Jackets out of camp next season. He’ll get called up as needed this season. But if he impresses in camp, he could make the team as the 13th or 14th forward. I’ll be paying close attention to him in camp. Abramov was the fan’s choice for dark horse that will make the Blue Jackets. With the skill he brings to the table, it’s certainly possible. He’ll have extra motivation to make the team. The AHL is not an option for him. I'd have to say Abramov. He was QMJHL MVP, and he has an awesome shot. He's a Russian sniper and I like his potential. Abramov was the MVP of the Quebec Major Junior Hockey League in 2016-17. He then played for the Monsters at the end of their season and didn’t look out-of-place. But because he’s just 19, it’s either Blue Jackets or juniors. He’s proven everything he can (outside of winning a championship) in junior. But is he ready for the jump to the NHL? Abramov is a case in which the AHL makes the most sense. But because of the CHL-NHL agreement, that can’t happen. I suspect he goes back to junior and makes a run at a championship. But if he impresses in camp, we could see him in the fall. Not bad for a third-round pick. If you want a true dark horse to make the Blue Jackets that is getting zero attention, it’s Scott. He has the kind of game that translates well to the next level. Scott was one of the most consistent players for the Monsters last season. His consistency earned him a midseason call-up to the Blue Jackets. Although he didn’t play, it spoke volumes of what the team thought of him. When he returned to Cleveland, his confidence showed. Scott got to play with Milano and the duo showed good chemistry. Scott did everything asked of him and did it well. He can score. He can make plays. He is defensively responsible. On a team with an opening on the fourth-line right-wing, Scott could make the team. He is my choice for longest shot to make the Blue Jackets. 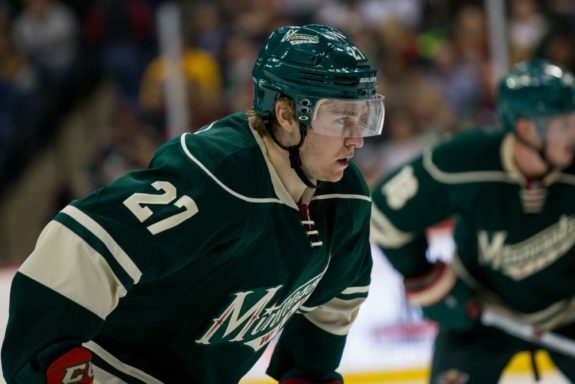 Dalpe came to the Blue Jackets via waivers from the Wild. He gave the Monsters a huge jolt of offense that got Cleveland to the verge of the playoffs. With bottom-six center not set in stone yet, Dalpe could make this team, especially if Dubois falters. Zac Dalpe’s hot second half could land him a spot on the Blue Jackets this season. I list him here because I believe he eventually makes the Blue Jackets. But it was his season for Kelowna that jumped out. He scored 70 points in 60 games and added 21 points in 17 playoff games. He also played for Switzerland at the World Juniors. Not bad for a seventh-round pick. Thurkauf seems destined for the Monsters so he can get used to the pro game. But we need to keep his name in mind. He qualifies as a dark horse now. If he shines in camp, he could make the team. To me, he’s a regular in the lineup in 2-3 seasons. Moutrey is such a treat to watch. His passion and energy have helped the Monsters in different ways. He can play all over the lineup. He can kill penalties. He can get under your skin. This is the kind of player John Tortorella would love to have. With spots open at forward, why not Moutrey? He has just as much chance as any other dark horse. Ah finally, a defenseman. The Blue Jackets are high on Kukan. His issue is the depth projected to make the Blue Jackets. But we must remember the team will make room if warranted. John Davidson told me last season to watch Kukan. He in particular is a fan of Kukan’s game. He’ll likely play top minutes for the Monsters and get the call if the Blue Jackets need a defenseman. looking forward to checking it out! Maybe Kukan makes the team as an extra D-man, so I'll pick him as my dark horse. As previously mentioned, Dubois’ spot is not guaranteed. A player like Broadhurst could force the Blue Jackets’ hand in camp. He played most of last season as the top center for the Monsters. He could be ready to make the next step. On a team looking for a center on the bottom-six, we cannot rule Broadhurst out. Defense: Werenski, Jones, Johnson, Savard, Murray, Carlsson, Nutivaara. Forwards: Panarin, Wennberg, Atkinson, Dubinsky, Foligno, Bjorkstrand, Jenner, Dubois, Anderson, Calvert, Sedlak, Schroeder, Motte, Milano. Now it’s your turn. Is there a player on your radar who didn’t make this list? Feel free to leave your comments below. Stay tuned next week as we will go in-depth into finding William Karlsson’s replacement. 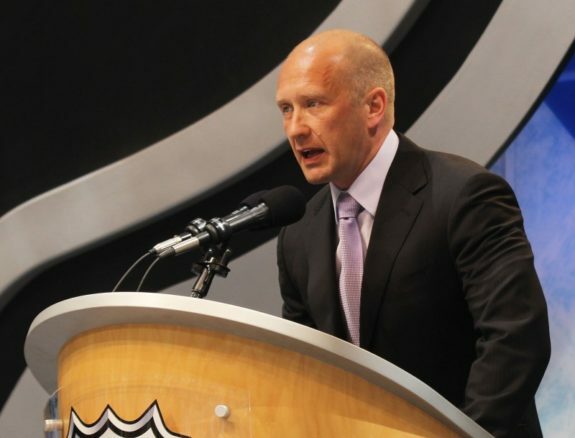 Which players could fill that role and how will that impact the Blue Jackets? See you next week.